People commonly rupture the anterior cruciate ligament (ACL). It is the most common orthopedic injury seen in dogs, but is more properly called the cranial cruciate ligament (CCL). In dogs, the injury is often a slow, progressive degeneration of the cruciate fibers as apposed to an acute traumatic injury seen in people. Dogs can have a combination of cruciate ligament degeneration, or partial and complete tears, hence the name “Cranial Cruciate Ligament Disease”. The CCL is one of the most important stabilizers within the knee joint. 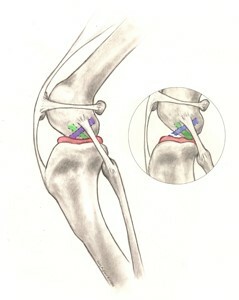 The CCL runs in a diagonal direction connecting the femur (thigh) and tibia (shin) bones, within the knee joint. The meniscus is a cartilage like structure between the femur and tibia bones. Its function is to provide shock-absorption and cushioning to the joint. The meniscus can be also damaged when the CCL is damaged. Cruciate ligament degeneration can be caused by a combination of factors including: age, obesity, conformation, physical condition, genetics and breed. Unfortunately 40%-60% of dogs that have cruciate disease in one knee will develop disease in the other knee. Partial cruciate tear is common, and most of the time will progress to a complete tear and possible meniscus damage. 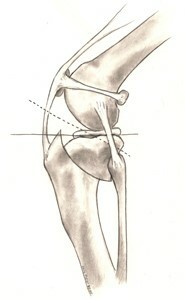 Diagnosing a cruciate ligament injury in your pet is made through a combination of techniques. Gait analysis to watch your dog walk, palpation of your pet’s knee and x-rays. 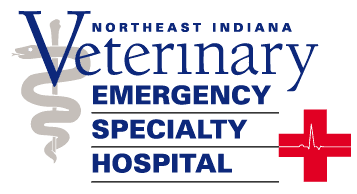 X-rays of the knee help to determine the degree of arthritis in your pet’s joint, to help plan for surgical correction as well as to rule out any other concurrent injuries. This is a traditional surgical technique used to replace the function of the cruciate ligament with a heavy nylon suture, placed around the knee joint in a similar orientation to the original cruciate ligament. The goal is for the nylon suture to provide stability around the joint until fibrous (scar) tissue forms and can provide additional stability. These techniques are ideal in pets less than 25 pounds. In larger and more active dogs, the repair outcome is less predictable. Postoperative care is critical to successful outcome and consists of 8 weeks of exercise restriction, followed by 4 weeks of a gradual return of activity. This surgery involves making a radial cut in the top of the tibia (shin bone) to change the contact point between the tibia and femur (thigh bone). The new orientation puts the stifle at a relatively stable position, independent of the deficient CCL. The cut in the bone is stabilized with a bone plate and screws. Postoperative care is critical to successful outcome and consists of 8 weeks of exercise restriction, followed by 4 weeks of a gradual return of activity. 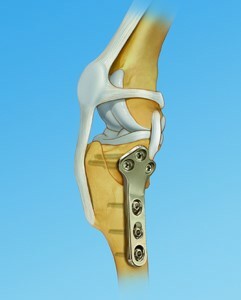 Illustration of the TPLO procedure utilizing bone plates and screws. Image provided by Synthes (USA); copyright notice: 2012 © Synthes, Inc. or its affiliates. All rights reserved. This approach is not a treatment because it does not provide stability to the knee. This protocol may help alleviate inflammation in the joint somewhat. Overtime, the symptoms of lameness may resolve in some dogs, but with increasing activity, pain from progressive osteoarthritis will persist. This is not an ideal approach for most patients and successful outcome is rarely achieved. Perioperative rehabilitation performed by a certified rehab practitioner can shorten recovery time. This is often not recommended instead of surgical correction, but in combination with one of the surgical modalities listed above. There is little to no research available that custom braces or orthotics can improve the recovery of post-operative patients or can be recommended instead of surgical correction. Many patients following surgery make a near complete recovery, and return to normal activity following the 12 week recovery period. Many of our patients return to work and have been used for agility and hunting. Pain related to arthritis may become evident as the patient ages but can often be managed with joint supplements, anti-inflammatories and weight management.